Halloween is a holiday that as an adult I’ve never much liked or gotten into. I’ve liked it even less since we’ve had Tasha, as the constant ringing of the doorbell and knocking at the door along with the concomitant activity of all the kids has her barking steadily all evening. For the past couple of years we’ve decided that the best thing to do was to have her spend the night at her favorite resort. But 31 October now has another significant meaning for Terry and me. It was one year ago today that our regional electric and gas utility, Pacific Gas and Electric (commonly known as PG&E), showed up at our door at 7:30 in the morning and replaced our electric meter with a new Time of Use (TOU) meter. This meant that Terry and I could flip the switch and turn on our new solar-powered system. We’ve been very pleased with our decision. It has reduced our utility bill each month considerably, and I expect that when the calculations for the true-up period, which ends today, are made, we will have a net negative, in dollars, at least, if not in actual kilowatt-hours. Having solar has engendered behaviors that we did not necessarily expect. 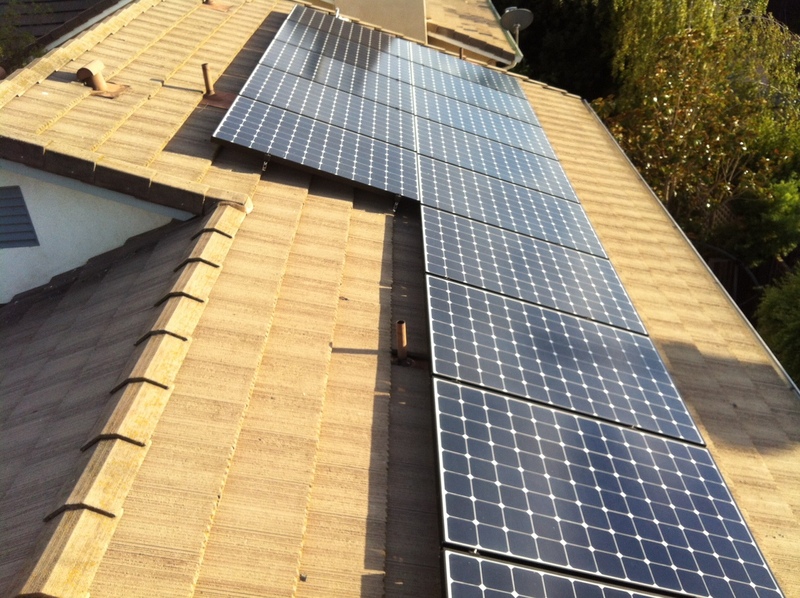 Rather than simply having solar to help reduce our electric bill, I felt motivated to ensure we had a negative electric bill in those months when the amount of sunlight and length of the day made that a possibility. The months of May through October are considered the summer season for billing purposes, and weekdays 1:00 p.m. to 7:00 p.m. are peak hours. That means if we are feeding back into the grid during those hours we can have a negative electric bill in dollars, even if overall kilowatt-hour usage for the day is positive. That’s because the rate PG&E pays us for electricity during those hours is higher than what we pay them during non-peak hours. Rather than cranking up the air conditioner as we thought we might as a result of having solar, we have our thermostat programmed so that the A/C doesn’t come on until 7:00 p.m. On especially hot days we’ll pre-cool the house in the morning and turn the air conditioner off at 12:59 p.m. In a similar manner, we thought we might use having solar as a reason to fire up our hot tub once again. So far we haven’t. No doubt we did the right thing both from an environmental and a financial perspective. And our behaviors are, I believe, the right thing from those two perspectives as well, even if they aren’t what we expected them to be. I’m not sure if the Tony Orlando and Dawn song “Candida” is based on the Voltaire novel Candide. After all Candide is a male and Candida seems to be a female. But the content of the song seems to loosely reflect the theme of the novel. In any case it struck me that these two songs might be justifiably juxtaposed. What I find interesting is the number of second choice successes. As I wrote, the producers of the Mary Tyler Moore Show first wanted Shelly Berman for Lou Grant. Their second choice was Jack Klugman. In fact, Gavin MacLeod read for that role before reading for Murray. Looking back we all know that Ed Asner was the perfect Lou Grant and that Gavin MacLeod leant exactly the right demeanor to Murray. I’ve seen it stated that the producers of Casablanca wanted Ronald Regan for the role of Rick. Ronald Reagan? How could Rick possibly be anyone other than Humphrey Bogart? Geneviève Bujold was hired as Captain Janeway for Star Trek: Voyager. She spent half a day on the set before she realized the rigors of filming an hour-long TV drama series were nothing like doing a film. She walked off after that half day, and the role went to Kate Mulgrew, who nailed Janeway. And the role revived her then-flagging career. I love those stories and the casting decisions that work out. I rarely request a premium when renewing my membership to a public radio station, unless it’s a T-shirt or coffee mug or the like. During the last pledge drive for KCSM, my jazz station, however, the Friday afternoon announcer kept playing excerpts from a CD by Bob Applebaum called Friday Night Jazz Service. I really loved the music. It is a CD of jazz arrangements of traditional Shabbat melodies. It wasn’t available at Amazon or on iTunes, however, so I renewed my membership, though I’m not sure it was actually up for renewal, and did so at a level higher than required for the CD. It arrived last week, and I played it on Friday. Marvelous! It’s soothing spiritual music perfect for then end of a hectic week. One certainly doesn’t need to be Jewish to appreciate it. If you like sacred music or if you like jazz I think you’ll enjoy this album. A very different setting for words that have long been known via a popular spiritual song. When we talk about food that harkens back to our childhoods, Terry and I often revert to kid talk. We talk about grilling hagaburs outside or fixing pseghetti for dinner. We aren’t the only ones who do that, are we? I don’t believe I’ve ever mentioned two of the dishes we use quite frequently at the dinner table. They are our soup mugs. When I make chili, or clam chowder, or any number of dishes in the pressure cooker that use a lot of liquid they are what I serve the meal in. The reason they’re worth mentioning at all is their provenance. I was working at VeriFone in 1997. Different groups were in different locations before our move to our new building in Santa Clara in the spring of 1998. My group was in downtown Palo Alto, which I absolutely loved. Our team was small; there were about five of us. Our manager decided that we needed to have a group activity. We ended up going to one of those create your own pottery studios one Friday afternoon. I’m not much of an artist, but that was nothing new there, and they had plenty of stencils for people like me who are artistically challenged. So I picked out two soup mugs and started decorating. I left them to be fired and picked them up several days later. Terry was happy with the result and let me keep them. We’ve been using them regularly ever since.